How can our yoga practice become a deep appreciation of the richness of our everyday existence? Join Lara and Brooke to explore the full spectrum of what it means to be human, as we dive into the exquisite depths of breath and body, accompanied by the soaring live sounds of Benny Holloway. To move sensually means to awaken to the infinite myriad of internal senses unique to you. So much inspired input is tasted by the body and yet, most inner languages we aren’t sensual enough to ever sense, or understanding enough to ever understand. When we start to truly pay attention to the highest intelligence we have ~ the body’s hums and sighs and moans and huffs ~ the subtle languages of the body ~ they tell us what is right and what is to be left. Join Brooke Elliston for a 2.5 hour masterclass into the Full Body Yes set to the cell-penetrating live vocals of Benny ~ a class of sensual spinal waves, liberating heart opening and revelation into all pathways of Yes within you. Whether you are aware of it or not, you are love in locomotion. Just like the sun loves the moon, the body loves its breath, and the inhalation is forever infatuated with the exhalation. In every moment of your existence, your body is the vessel of the most intimate affair of all – the consummation between flesh and the life force that animates it. Join Lara for this prana vinyasa pilgrimage, diving into this source of Love inside. To reconnect with that most sensual and supreme romance alive within your very selves cells. 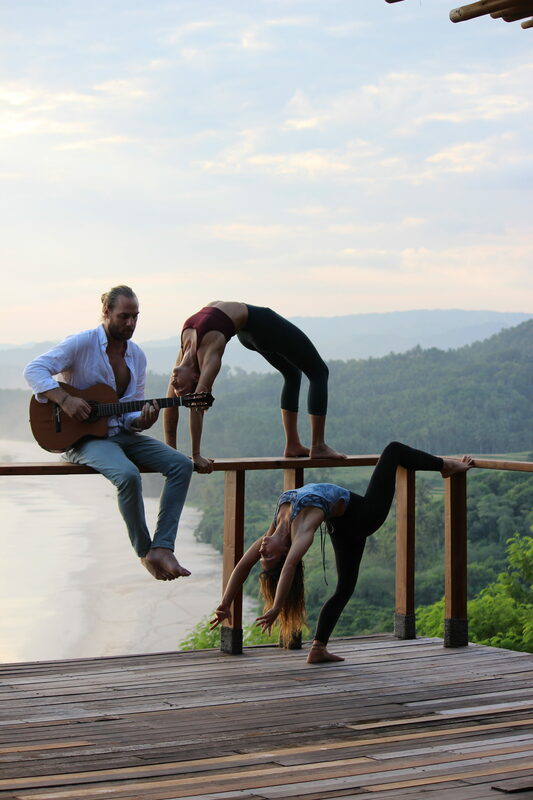 This practice is an ode to existence, a passionate and compassionate exaltation of embodied appreciation through a creative spine-rising, heart-flowering slo-mo vinyasa flow, paired with ecstatic musical expression by Benny. Get ready to embark upon an illuminating journey through the senses as we exit the fast lane and slide into the slow river of wonder. Through deliciously deep yin postures and a guided psychic sleep visualisation, paired with a transcendental live soundscape of voice and guitar, you are invited to listen, not just with your external ears, but as if every cell in your body turned into an organ of perception. This deep dive into the bliss body is a call for conscious connection with ourselves as we learn to inhabit our bodies in a profound way. Holding ourselves tenderly in the luminous field of our own awareness, providing sanctuary for the vivid appearance, flavour and texture of sensations as they weave their way through you and out of you.